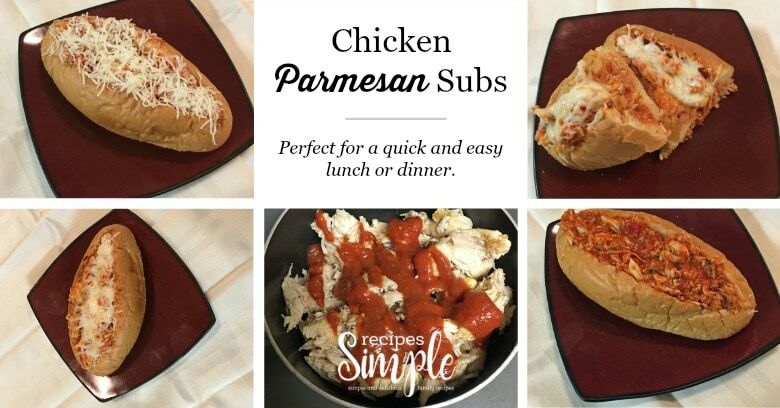 These Chicken Parmesan Subs are perfect for a quick and easy lunch or dinner. I buy a Rotisserie chicken from the deli and shred some of the chicken to use in this recipe. You can add more chicken and use the whole jar of pasta sauce if you have a large family to feed. You can serve it with your favorite side such as chopped vegetables, Cole slaw, potato salad, chips, salad or a side of pasta. Combine sauce, garlic, Parmesan cheese and Italian seasonings in medium sauce pan. Add shredded chicken to pan and heat thoroughly. Cut out the middle of the sub roll. Set aside small amount of Mozzarella cheese for sprinkling on top the sub and evenly divide remaining cheese between bottom of both rolls. Add chicken mixture. Top with additional cheese. Place sub on an oven safe pan and broil until the cheese is melted.